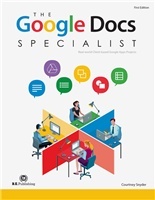 Using Google Apps, students complete work orders for their employer, The Google Docs Specialist, Inc. Across over 35 projects covering core Google Apps skills, students produce professional documents for three clients, mirroring a real business environment. The Google Docs Specialist is three simulations in one book, using five of the most popular Google productivity apps: Docs, Sheets, Slides, Forms, and Drawings. 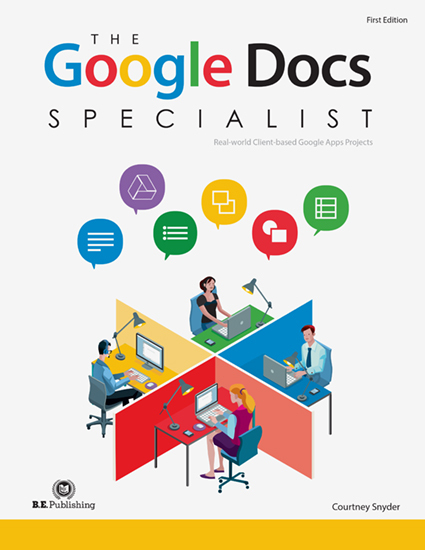 The Online Instructor and Student Resources for The Google Docs Specialist are required and include professionally designed client logos and Project Solutions. Project Solutions demonstrate what student work should look like in order to simplify grading for instructors. Hi-resolution logos are provided to students in .png format, allowing them to produce professionally-styled documents.